Big old bully got your number? And they said the wedgies would stop after junior high. Time to flip the script with Brazilian Jitsu! During this BJJ class you'll learn that proper technique, leverage, and ground positioning will beat size and strength in almost any fight. 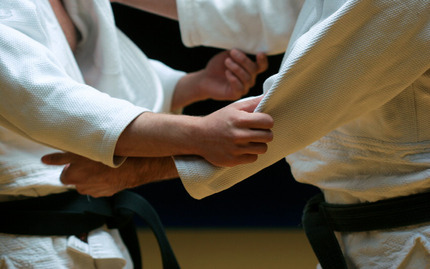 You'll focus on learning to find the competitive advantage through the use of takedowns, joint-locks, and chokeholds. Sooner or later most fights end up on the ground, and this style will teach you to get there faster, and win with ease with quick and efficient grappling moves. BJJ is both an effective self-defense technique and one of the most popular styles brought into the cage in mixed martial arts competition. You'll focus on the fundamentals and applying those techniques to live sparring practice. In addition to building the confidence that you can win any fight, you'll be getting a great workout, developing both your stamina and flexibility. Next time someone tries to take your lunch money in the office cafeteria, introduce them to your little friends, lighting and thunder!